Vintage - Colclough Fine Bone China, Pattern #6588, Duo Tea Setting (Cup & Saucer), Made during 1937 thru 1948 - Two Pieces. 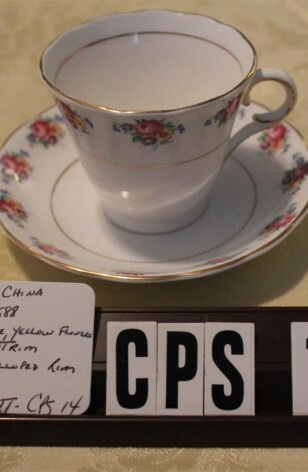 This Vintage Colclough China, Duo of Cup and Saucer, are in Pattern #6588. A Lovely Floral Pattern on White. There is a Wreath of Red Roses, Blue, Lavender and Yellow Flowers on the Lip. There is also 22kt Gold on the Verge, along with a Scalloped Edge. Plus 22kt Gold Rim on the Plate and Cup, with a 22kt Gold Ring on the inside of the Cup as well. Great Condition. This Vintage Colclough China, Duo of Cup and Saucer, are in Pattern #6588. A Lovely Floral Pattern on White. There is a Wreath of Red Roses, Blue, Lavender and Yellow Flowers on the Lip. There is also 22kt Gold on the Verge, along with a Scalloped Edge. Plus 22kt Gold Rim on the Plate and Cup, with a 22kt Gold Ring on the inside of the Cup as well. Very Good Resale Condition unless noted below or in pictures.